BlueDiver Dot Mitochondria4 IgG + IgM is an Immunodot kit intended for the detection in human sera of IgG/IgM autoantibodies against M2/nPDC, M2/OGDC-E2, M2/BCOADC-E2 and M2/PDC-E2 antigens. Each kit contains 24 tests. 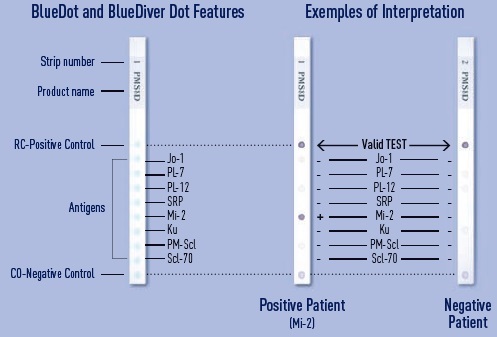 BlueDiver Dot kits are composed of 24 nitrocellulose strips on which the antigens have been coated in a dot-shaped format. One strip allows the testing of one patient for many different autoantibodies in the same run. The test is based on a classical Enzyme ImmunoAssays (EIA). The first one, the Reaction Control (RC), controls the validity of the test : its coloration proves that the clinician has added the patient serum and that the test has functioned correctly. The second one, the Cut-Off Control (CO), allows the interpretation of the test : any color intensity equal to or below that of the cut-off is considered negative, any color intensity superior to that of the cut-off is considered positive. The BlueDiver Dot are automated on the BlueDiver Instrument. The complete processing time lasts just 1 hour. The results can be interpretated by sight or a semi-quantification can be obtained thanks to the BlueScan scanner and the Dr DOT software (minimum version 3).